The team visit Stoke-on-Trent, where presenter Paul Martin finds time to visit Little Moreton Hall, one of England's finest Elizabethan manor houses. once dominated the landscape around here. They're bottle kilns and they were used to make some of the world's finest ceramics. 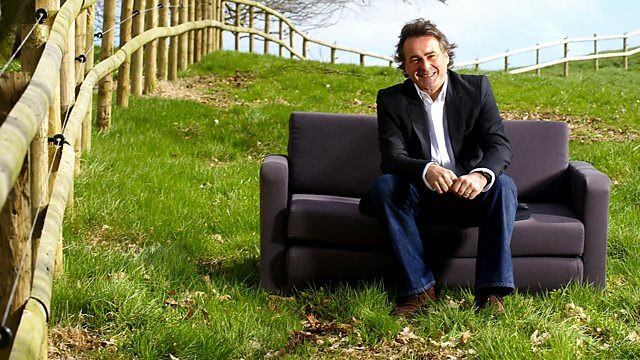 Today, Flog It comes from Stoke-on-Trent. Now, are we gonna find some ceramic gems here today? Well, we're in the right place, but it is the right time? That is down to our two experts, Mr David Barby and James Lewis. -Smile, you're on Candid Camera. And that's not the only camera here today! and see what they've brought along. And James has already turned up two cheeky-looking chaps. as soon as I saw them, I loved them. and what we're looking at, of course, are table lighters... A pair of them. This one, the hinge is fine. makes them a little bit more sought-after, I would imagine. What do you think they're supposed to represent? Is it "Alas, poor Yorick"? and thinking, "Goodness me, surely I can't be related to that!" "Oh, no, please don't tell me I'm related to one of those!" But they're great fun, aren't they? -And the key word is "novelty". and the novelty all combined, that's what people are looking for. -A bit of a problem, they've been damaged at some point. -Zoop, straight to the floor. -They've been out in my workshop for three years. I do it out there. They've been left out there because the wife didn't want them in the house. It was taboo. I gave up many, many years ago. I have to say, I think they're great, I really like them. -And I think they're great fun as well. I mean, this one being damaged, I suppose, is just a few pounds. That one has got to be worth £80 to £100, I should think. -So if we put an estimate of £80 to £120 on the two? -Do you want a reserve? -You'll take them at that? -So they don't give them away! Absolutely, no, I agree. It's Adam Partridge who will be selling them. Well, I think a collector would really go for them, wouldn't they? It kind of looks like Adam Partridge, doesn't it? -Oh, ooh! Don't tell him that! -Well, that will be me, then! Has it always been in the family? Yeah. It's been in the family for as long as I can remember. Was there a great sort of devotion to King Edward? many years ago a tankard for a friend of mine who used to sing "Sally". and here we have "God Save The King". Now, that was an interesting move for the pottery company, wasn't it? of the abdication, so they covered both sides, didn't they? is in such excellent condition. The handle is decorated with all the symbols of Great Britain. and there, the shamrock for Ireland. and I think we should put a reserve of £50 on it. -I'll keep my fingers crossed for you. Shall we just have a little bit of a play before you say goodbye to it? MUG PLAYS "God Save The King"
you're obviously a big music fan and so am I.
are these two little posters, they're like flyers really. around the venue to promote the gig. the Seventies with that sort of purple haze. -There's no date on it. Do you know what date it was? And he was playing in Oklahoma. -I guess you grew up in Oklahoma. -That's where I'm from, yeah! -So what brought you over to the UK then? -You married an English lass? Did you get to see Led Zeppelin? No, I didn't. I was a bit young at the time. I was gonna say, you look a bit young. and Led Zeppelin has reformed this year. and try and copy all his sort of licks and his moves and his sound. -The question is, were you any good? I think that's also 1970. Right. Great band, but I don't think our auction is the right one for you. this one is worth around £80 to £150, and so is that one. So that's not bad, is it? so good for you, because condition is so important. Pat, I love this period of art. and I associate this with the pre-Raphaelites. -and, of course, the subject matter is Arthurian, is it not? -What fascinated you to collect these? -They were passed down to me. originally in a wash stand. She must have bought them in the early 1900s. to have had a wash stand with these Minton tiles installed in the back. and each tile would either have its initials or his full name there. there's going to be tile collectors up at the auction we're going to. because you can understand why. and the colour tones are in this sort of beige and dark brown. and they're very much in vogue now for collectors. and then we have these Walter Scott tiles at the back. These would not have come from a wash stand. into the back of a chair or insert into a wardrobe or maybe a fireplace. -It's a lovely collection. Why are you selling them? We've always been intending to do something with it and never done it. where a lot of these came up for sale. to put an estimate at between £200 and £300. Would that be agreeable? -That would be very agreeable. a reserve just tucked under, so I would say we put the reserve at £180. That would be very agreeable! -I hope we're gonna get it after all of that! but right now it's time to put our experts' theories to the test. here's a quick recap of all the items that are going to go under the hammer. and charm their way into a new home. singing mug has it, with bells on. for this fine collection of Minton. Our auction today is in Knutsford at Frank Marshall's. I'm going to catch up with him and have a quick natter about one of our items. Now these are a bit of fun. Bookends, really, if you like. but they're table lighters, they belong to Keith. I think his son has damaged one of them and they've been using them as bookends. £80 to £120 was put on these by James. "With compliments of S Murphy." So they're a gift, aren't they? It's a strange thing to have, isn't it? -Yeah. They've got the look, though. I mean, this one has had his arm off as well on the front there. -Adam is not going ape about these! so let's see what the bidders think! -We've got £80 to £120 put on by our expert, James. I had a chat to Adam, just before the sale started. and that's the right price. Why do you want to flog them, though? Well, we are emigrating to Australia. Oh, are you? That is a major, major decision. -How long have you been thinking about doing that? -We've got the eldest children out there, established. So you're going to retire out there? That's true. They've been out there for years and they've got good jobs. What a great country to go to. Been there are few times myself. -I think they should just do a little bit more than 120. It's just that hinge at the back. -It can be sorted out, though. Let's find out what the bidders in Knutsford think. table lighters in the form of an ape contemplating a skull. There we are. Cheeky little monkeys there, lot 99, £80 the pair. 60, 5, 70, 5, 80, 5, 90, 5, 100. 95 at the back of the room, 95. Is there 100? -110, 120, 120, 130, 140. 130, any more now, 130 and we sell. -of the estimate. We did it, though. Good result. but it's something towards the trip, isn't it? Congratulations. up for grabs, £200 to £300. They belong to Pat, and I think these will fly away. Arts And Crafts very much in vogue. -haven't they, for a long time? -They have, probably 60 years. We've changed the newspaper now and again! We're gonna find out what they're worth, right now. This is it. 423 is 11 Minton tiles, designed by John Moir Smith, lot 423. 11 of these, £200 start me, please. 100 then to get on. 100 bid, 10 now, at £100, 110 are you? 110, 120, 130, 140, 50, 160, 70, 180, in the room 180. -Any more now? Any further on these? At 180, 11 of them at 180. Let's have a bit more, shall we? At 180. Are you all done at 180? So, 180. Just got them away. -That was the reserve, so can't grumble. going to probably a buy a few things, little extras. Well, we heard it play God Save The King earlier. of the estimate and gets that £80... PLUS in fact. That's what we want. It is a bit of fun, isn't it? It's a lovely little piece, yes. Of course, it's the association. It's King Edward, who abdicated, and how many of these were made? And how many that survived are still playing? Here it is, it's coming under the hammer now. Crown Devon Edward VIII musical commemorative mug. There we are. How often do we see Edward VIII items brought to us as rarities? But this is a nice one, lot 353, and I can start with a bid of £50. -Take five. At £50. £50, 5, 60, 5, 70, 5, 80, 5, 90, 5, 100. 120, 130, 140, 150, 160. -200 in the room. £200. All done at £200. Selling then. -That must be a record! that, but plenty of money to spend! -What are you gonna do with that? -You haven't got a clue, have you? -You haven't thought about it. New fence. -Wow, wow, wow, wow, yes! Now, cast your mind back a few hundred years. The year is approximately 1610.
but here, in Cheshire, work has just finished on the home of one William Moreton III. timber-framed manor houses in England. and extended over future generations. It's a stunning display of medieval craftsmanship. at different stages. The infill of the wood is plaster and lath. would have been a lovely golden ochre colour, quite vibrant. It was the Victorians that painted everything black and white. They even painted all the oak beams black! But look at it! The more wood, the more money you had. state, because all this would have been felled from the local forest. that hold the whole thing together. They're known as "trenails". Treenails. panoramic view of architectural delight. Just look at it! You get wonderful ornamentation all around the doors and windows. It's so typical of a Cheshire build. I love the quatrefoils, with hand-carved balustrades. It's another detail that just catches your eye. and these windows must have been so expensive in their day. see these great big bulbous drop pendants, all hand-carved again. "Rycharde Dale, carpeder, made thies windovs by the grac of God,"
and the date was 1559, and it's still standing! They really did know their trade. and David Watts is the property manager. about the history of this magnificent house and its lucky owner. I've gotta say, absolutely mind-blowing, isn't it? And I know it sounds corny, but who would live in a house like this? who came into the area, we think, around the 13th century. and each generation wanted to add their special part to the hall. Fantastic bay windows, magnificent ranges of glass. It's one of the best examples I think I've ever seen. I want to show you another room, with fantastic decoration. Take a look at this, Paul. Gosh, look at that? Tudor wallpaper. onto the paper, and then, of course, it's pasted onto the wall itself. Incredible! Have you depicted what the stories are telling? It's the story of Susannah And The Elders. So, come on, tell me about that. and she refused their advances. -and, in fact, it's the two elders who are then put to death. and you get little details, like the wolf's head on the frieze. That's the Moreton coat of arms. Now, interestingly, of course, the fashions change. The fashion becomes, let's put wooden panelling on instead. And what do the Moretons do? They replace it with that. By virtue of putting the panelling over that, it has protected it. but, overall, the house is in remarkable condition. It's a very solid structure. quite sparse inside because the space has the beauty as well. It makes you appreciate the architecture. In many ways, our collection is the building itself. -Yeah, it's one big antique, isn't it? a perfectly preserved piece of medieval history. Phyllis, Ben, I think you might have the award for the youngest person here today. 11? Are you a collector? -something you found yourself, or is it a family piece? Is it? Who does it belong to? -Something you like eating your cereal out of it? has designed this... a chap called Frederick Rhead. Have you heard of Charlotte Rhead? -Charlotte Rhead, no? I'll tell you about her. and he worked in the Potteries, he worked in various factories really. He worked for Wedgwood, and he also worked for Foley Intarsio. and this is what Frederick Rhead is most famous for. This is known as tube-lining. Have you ever piped icing on a cake? Had a go? Well, this is basically the same principle. and Frederick Rhead was well-known for reviving the fashion for it. The actual name, I don't know, but the range is Elers Ware. and I know you've done some research? that it was Wood & Son, and then it came to "Sons"
-so it's got to be in that range, so it could be 100 years old. and that ties in perfectly with the mark we have on the base. OK. Well, having said all that, it's time for a value. What do you think? -Would you sell it to me for 50? I don't blame you! OK, well, I think it's gonna be worth more than that. -on it, hoping it would make around mid estimate. -Let's take it to auction and see how we do. Can you come? -Maybe. Gotta find out if you can have a day off school. -But you're definitely gonna come, yes? -Super. See you. Fingers crossed we'll see you. Isn't this absolutely fascinating, Cath? It's a map of Paris, dated 1780, nine years before the French Revolution. -one of these, wouldn't he? This is extraordinary! Where did it come from? Well, my father left it to me with one or two books. -Did you have an interest in maps? during the rain because it hasn't got any runs or stains on it. plate here, which is so decorative. two emblematic figures either side, and the Royal Coat of Arms here. absolutely fascinating, is the one that this is concealing underneath. This one here is Bradshaw's Map of Canals. Now, what do we associate Bradshaw with? Well, the canals and things like that, surely! Yes, but also he became famous with his railway maps and timetables. Oh, yes, of course he did, yes. That dominated the whole of the 19th century. You could rely on Bradshaw's. This is fascinating, because where is Stoke? which is a very, very early map of the area. of houses you see are very few. Now, how much are we going to get for these? This is huge. This is a quarter of a whacking great map. terrific on the wall, wouldn't it? Likewise with the Parisian map. I'd like to see this do certainly over £100, let's say £150. I think we've got to box very clever. so I'm going to suggest £80 to £120 as the estimate. -Are you going to invest in more modern maps? and what do we find? Worcester! Anyway, there we go. but one of the most famous factories of all time. -They were my father's, actually. and it seems a terrible shame, really. and here we've got three very good examples. much of this - this is by Bagnall but all around the same sort of period. or puce circles, and on either side of that there are a series of dots. and then you add a dot for each year. You've got nine dots, that's 1941.
but we've got a little telltale giveaway here - Buenos Aires. Well, there we are, so that's got a bit of interesting history about that one. but these are all hand-painted, so these are very, very sought after. eat them, a real feel to them. Not really. We've never had them professionally valued. OK. I'm gonna put them as a group. split them up if they want to, it depends on their own client base. We'll say £80 on this one. The larger one, I think, is worth around £120. This one, £200 to £300. -So, if we say an estimate of £400 to £500 on them, as a three? -Could we put a reserve on them? As a group, let's put 400 on them. So what are you gonna do? Buy a great big piece of fantastic Wedgwood to replace them with? Well, Worcester is something that we just can't get enough of. Let's take them along and see how we do. But first, let's have a quick recap of all the items we're taking to the auction room. I can see why this Frederick Rhead bowl caught James's eye. It's a classic piece and it's in mint condition. These extraordinary maps tell a tale of two countries. Their tip-top condition should guarantee good interest. collection of Worcester. Let's hope the collectors are out in force! reckoned with, but this one is by Frederick Rhead, her father. It's a lovely little vessel and it belongs to Phyllis and Ben. What's Grandma been up to? She's sort of organised a sweepstake, hasn't she, Ben? -No, actually, I think it was Ben's idea! Do you? Was this your idea?! It was his cunning plan. So what have you come up with, then? £70, OK. And what about Grandma? -Well, why do you want to sell this, just a bit of fun? so the headmaster has put it down as an educational day for him. -Because it is, isn't it? -It is so educational because you're always learning. If you keep watching Flog It, you're gonna learn loads, and knowledge is money in this business, isn't it? -Cos you get to spot those bargains. Well, we're gonna find out exactly what we three think right now. but it's going under the hammer, right now. and I've got 45, 50 and 55 bid. At this rate, you're all wrong! £55. Any more at 55? fixed at 60, so I'm afraid I can't sell it, even though I'm bid 55.
or do you want to take it out? -Take the offer? That doesn't happen in Christie's, you know! There's a little deal going on. He's just asked if we will reduce it. You've got a sweepstake on it as well, haven't you?! So maybe James will make up the fiver difference! £55, and we sell then. 55. Cor! Well done, Adam, as well. -And Ben won the sweepstake! -We've got to buy teas. Yeah, the teas are on you! Teas and coffees on them. No? He's got all the money, hasn't he? David and I have just been joined by Cath in the nick of time. in that beautiful little folder you brought in. canals in Britain and I think it's a lovely little lot, I really do. -I can see this going for a little bit more. -to Paris now and probably still see it around. It's the one with the canals that fascinates me, though. Well done, I'm kind of partial to that! Look, this is it. Good luck, both of you. -Let's hope it gets £150. -We've got some interest here, and I can start at £200. 380 bid. Any more now? 380 bid. Are you all done then? 420. -Gosh, I never expected that! -Neither was I, and I don't think you were, either! -A little bit of commission to pay, but what will you spend all that money on? We've got our first grandchild on the way at the end of August. -It's going to be Grandma's indulgence, isn't it? and I've been joined by Bill and Lillian. the smallest one, is £80, the second lot is about £120 and £200. -£200 to £300 for the pedestal cup. And we've got a total valuation of about £400 to £500 here. my notes, is going towards the model railway, is it? -I think he's had second thoughts about that. reminder that it is our 25th wedding anniversary this year. That's more important than a model railway! And I thought Adam would split them up. -lots of people here today and they're gonna do very, very well. Well, fingers crossed and here's the first going under the hammer. with fruits, by Albert Shuck, lot 367, little footed bowl there. £80. £80. 50, 50 bid, 5 now. At £50, 5, 60, 5, 65 bid. 70, 5, 80 now, 80 bid. 85. 85 online. Any more on this lot? 85. Any further? The bid's online this time at £85 on the first. £85. That's good, that's good. First one down. Here's the next. Worcester bowl painted by Albert Shuck again. Lovely bowl, 368. Start me at £100. 80 bid, 5, 90, 5, £95, any more? £95, 100 bid, 10, 110, take 120 now. 120, online at 120, any more? 130? Are you all done at 140? 150. Any more at 150? All done? 160, 160, keep going, 160, any more now at 160? Gosh, that was late in! -Any more now at 170? 180? At 190, 200. 200, any more now? -210. Are we done at 210? I think we're done at 210. All done at 210 and we sell this one at £210. How super! Second one down. That's good news. Here's the last one. with fruits. I'm bid 110. Take 20. 110 only, 120 now, 120. 150, 160, 170. 170 bid. 180 now, 180. 190... We've got the same thing happening again. 190? At 200. Any further now at 200? All done and selling at 210? -Yes, very good, very good. Well, they were spot on, really, with the £400 to £500, weren't they? Got the top end of the estimate. there's bidding on the phone andbidding against each other on the internet - fantastic! -You were dead right, dead right. Congratulations to James, and enjoy the wedding anniversary. -I'm sure we will, sure we will. Well, that's it, it's all over, and all I can say is what a mixed day, but a thoroughly enjoyable one. so until the next time, it's cheerio! The Flog It! team visit Stoke-on-Trent to value the public's antiques with help from experts David Barby and James Lewis. Presenter Paul Martin finds time to visit Little Moreton Hall, one of England's finest Elizabethan timber-framed manor houses.